The U.S. Interior Department says the greater sage grouse does not need federal protections across its 11-state Western range after some limits were put on energy development and other activities. Tuesday's announcement signals that the Obama administration believes it has struck a balance to save the widespread, ground-dwelling birds from extinction without crippling the West's economy. It follows a costly conservation effort, and could help defuse a potential political liability for Democrats heading into the 2016 election. Clock play to hear a radio story on the decision by KBSX reporter Frankie Barnhill. Federal protections could have brought much more sweeping restrictions on oil and gas drilling, grazing and other human activities from California to the Dakotas. Republicans have seized on the issue as supposed evidence of wildlife protection laws run amok. Environmentalists who sued to force Tuesday's decision are certain to challenge it. Saving The Sage Grouse: Is Just The Threat Of An Endangered Species Listing Enough? Alarm bells echoed across the West in 2010 when the U.S. Fish and Wildlife Service warned that the greater sage grouse could be put on the Endangered Species List. The end of this month is the deadline for a final decision. In the interim, there has been an enormous amount of work done to protect the bird – enough to suggest a threat is sometimes big enough to get the job done. Could this have been the intent all along? To make the threat big enough so that an actual listing might be avoided? 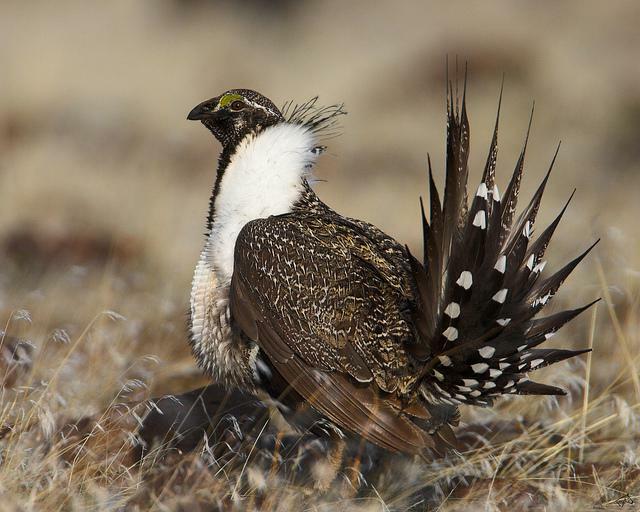 The greater sage grouse is under threat. Its population has shrunk by more than 90 percent in the last century. Scientists say wildfire, invasive species, energy development and other human activities are to blame. Now, the U.S. Fish and Wildlife Service will decide if the bird will be added to the Endangered Species List. The federal government will decide whether or not to list the greater sage grouse on the Endangered Species List later this month. Another sage grouse species, the Gunnison sage grouse, has been on that list since last November. The government followed a distinct and separate process for the Gunnison grouse, classifying it as “threatened”.